Umbrellas up! Occasionally wet and stormy forecast ahead, as scattered showers and thunderstorms make an almost daily appearance in the forecast this week. If you haven't been outside yet on this Monday morning, I can describe the weather conditions in just one word... Tropical. It's uncomfortably warm and humid, and we're seeing the latest (of many) round of scattered storms. Here's the setup. A large dome of high pressure is sitting over the northern Atlantic Ocean, serving as an atmospheric brick wall of sorts. That is keeping 1.) a very humid air mass, and 2.) an active storm track stuck right on top of New Jersey. As that high grows and shrinks and wiggles, it will directly affect the location and intensity of rain. In this article, I'm going to try to capture those changes on a day-by-day basis — but please know the details of this week's forecast are pretty low confidence. 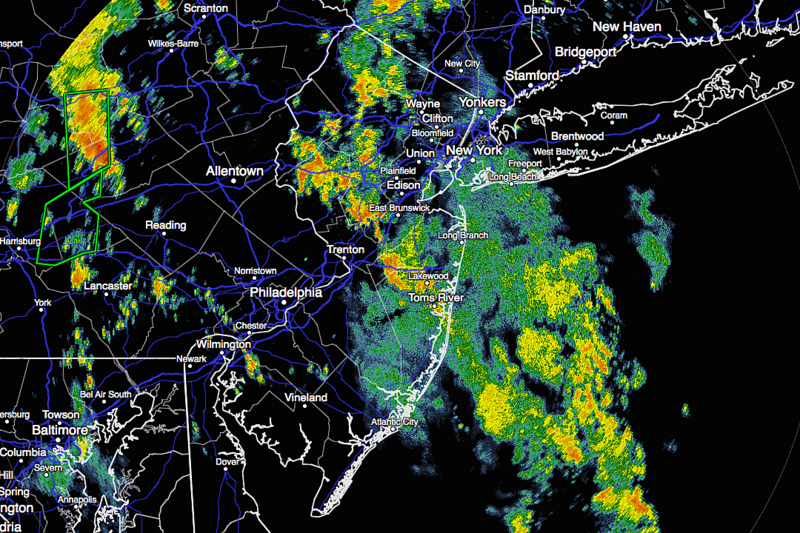 So hit-or-miss scattered showers and thunderstorms will continue to dot New Jersey throughout Monday. It's not going to rain all day and severe weather is not expected, although some heavier downpours may seriously dampen your day. In between the raindrops, it will be mostly cloudy and humid, with a stiff southeasterly breeze. High temperatures will range from the upper 70s along the coast, to the lower 80s further inland. It's already not a great beach day, given the persistent threat for rain. You might catch a few hours of dry weather, but not a lot of sun. In addition, a High Risk of dangerous rip currents and rough surf continues along the Jersey Shore for the third day in a row. The chance for a shower or storm will continue Monday night. And you'll definitely feel the mugginess in the air overnight. With dew points firmly in the 70s, low temperatures will only fall into the lower to mid 70s. For Tuesday, it looks like that dome of high pressure will nudge the storm track slightly to the west. That will put the best chance for showers over the Delaware River, along the western edge of New Jersey. And, if you want to be truly optimistic, the Jersey Shore could be treated to a few hours of sunshine at some point on Tuesday. High temperatures generally holding steady, in the lower 80s for most of the state. Then our forecast goes the other way on Wednesday, which is currently modeled to be the wettest day of the week. Once again, showers and thunderstorms are almost a certainty. In addition, a batch of steadier rainfall is possible — if the rain is really heavy over a prolonged period of time, it's conceivable that spots in NJ picks up multiple inches of rain. We'll have to watch for potential flooding issues. On Thursday, we'll actually get a taste of drier weather and less-humid air (dew points dip into the 60s). It appears the spread and intensity of rain will be limited on Thursday — I'll call it "isolated showers". Furthermore, drier air warms up much more efficiently than steamy air, so Thursday afternoon will be quite a bit hotter than the first half of the week. Thermometers will end up close to 90 degrees. Friday will start off fairly pleasant for mid-summer, with a mix of sun and clouds and hot high temperatures again in the upper 80s to lower 90s. Eventually, a cold front will put an end to the heat and humidity, and drive a round of showers and thunderstorms through the state. Our forecast models feature dissenting opinions regarding the timing of this front — GFS says Friday afternoon to evening, while the Euro is later, more like Friday night to Saturday morning. In any case, if there's one day this week that looks complete dry from start to finish, it's Saturday. Not only do we have a shot of a rain-free day, it might turn incredibly pleasant with partly sunny skies, low humidity (!!! ), and seasonably warm high temps in the mid 80s. Keep fingers crossed for a beautiful start to the weekend — I really hope this forecast holds, after the 75% soggy/stormy weekend we just exited. Sunday looks a bit more complicated and unsettled again. Temperatures look similar, in the near-normal mid 80s. But as skies become mostly cloudy, another round of rain could arrive late Sunday or early Monday at the latest.